Whoever thinks Warped Tour is just a punk rock / emo festival clearly didn’t check the incredibly loaded line-up this year. One of the stand-out exceptions is the talented pop singer Bebe Rexha. We’re please to present a rare interview with the EDM songstress, who’s on her first Warped Tour. So Bebe, you already did your set around noon. How are the first two days at Warped Tour for you? 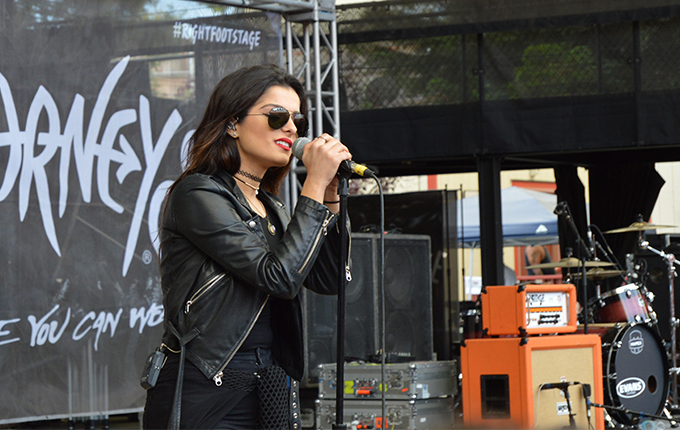 Bebe Rexha: I like having my set around midday. That allows you to sleep in a little bit, since it’s hard get some sleep on a moving bus. The great thing of performing early is you get your set done and then have time to hang with your fans and still have time to check out other bands. While you were growing up, your parents were very strict. How is it being out here on Warped Tour with a pretty wild crowd? Rexha: My parents are concerned about my safety but they’re also very excited to see me live my dream. To be at Warped Tour is the ultimate grime. If you love what you are doing, if you love music, you do Warped Tour. That’s an important step to really flourishing. This Tour is dominated by a lot of heavy bands. Playing pop and EDM infused music, you’re one of the exceptions to the line-up. How does that feel to stand out like that? Rexha: I was intimidated at first. The way I’m feeling my anxieties is pretty much like everyone else. But I grew up with a lot of pop and dance music, so that is how I express myself. You can take my lyrics and put them to a rock beat and play some rock music. It’s all about how you package it. But I’m happy to be a little different because the fans love it, no matter what. This is the true me. I’m not trying to be fake — a fake rocker or a fake punk or screamo. I’m just being Bebe and if people love me for that, that’s the best you can do. And it’s the most important thing for me. You worked with some big names in the industry like David Guetta and Pete Wentz. Which artists would you like to work with in the future? 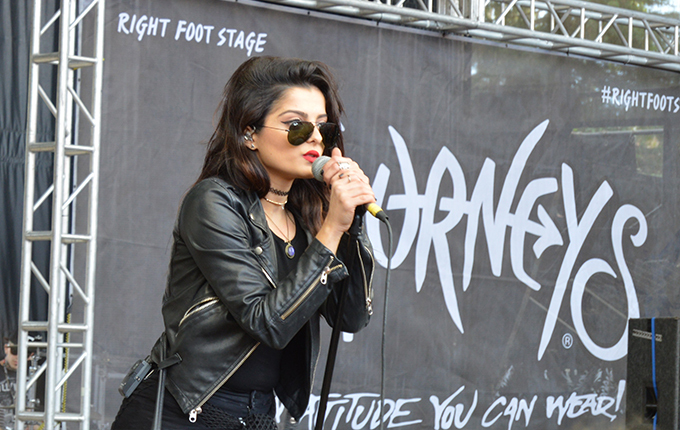 Rexha: After the Warped Tour I’m touring with Nick Jonas. We talked about making a song together soon. He’s very talented and I’m very excited to work with him. He is a great writer and guitar player. You’ve had so much success writing songs for others, like “Monster” by Eminem and Rihanna. How does it feel to be breaking through as an artist yourself now? Rexha: When you write songs you can make a lot of money. But all the money in the world can’t buy the feeling that you get when you’re on stage and just 20 kids know every word of your song and sing along. I’d rather be broke and travel the country, just making enough money to survive. That’s what I’m doing right now. I’m actually making no money of this tour because I put everything I earn back into my music, my merch and my band. This is just about seeing my fans and grow the fanbase. “I Can’t Stop Drinking About You” is a very catchy and dance-y song. What does a night out look like in the life of Bebe Rexha? Rexha: The honest truth, it’s pretty boring. Right now I’m partying a lot harder but I usually don’t really like to go out. When I drink I get very happy for a while and then turn really insightful and deep. A night out with me is weird. I’d rather have my friends come over. I get invited to a lot of celebrity parties but I rarely go. Showing off on red carpets is not for me. Of course it’s part of my job to make appearances, but parties are the least favorite part for me. Unless I’m doing a show, write a new song or do something exciting for my career. I love working and I love seeing my fans. Those are the things I really appreciate and look forward to. Back to Warped Tour. Which bands are you excited to see this year? I think that Mod Sun is cool. I’m really looking forward to check out Riff Raff. I like that Warped Tour is integrating Rap and even some Soul lately. Music is changing and it’s becoming genreless. I also want to check out Pierce The Veil and Black Veil Brides. I want to experience their music style and see the energy on stage. I was also really impressed by Night Riots. Their set is right before mine and I thought they were amazing. I’m really looking forward to see one of the new young bands with maybe 100 followers. It’s still early in the tour. There is still a lot to come. I’m excited!